This Packet lends itself well to a COLOR WHEEL project or any of the COLOR worksheets. There are several coloring pages of Vincent’s paintings included. Do not use these for the project this month. They are extra handouts. Consider typing up some of the basic information you have shared with the class and print it on the back of one of the coloring pages. Challenge kids to see if they can stump their parents with the information. This will give them an incentive to remember what was discussed. Negative space and positive space (grades 3-5) takes an interesting twist when discussing The Starry Night. 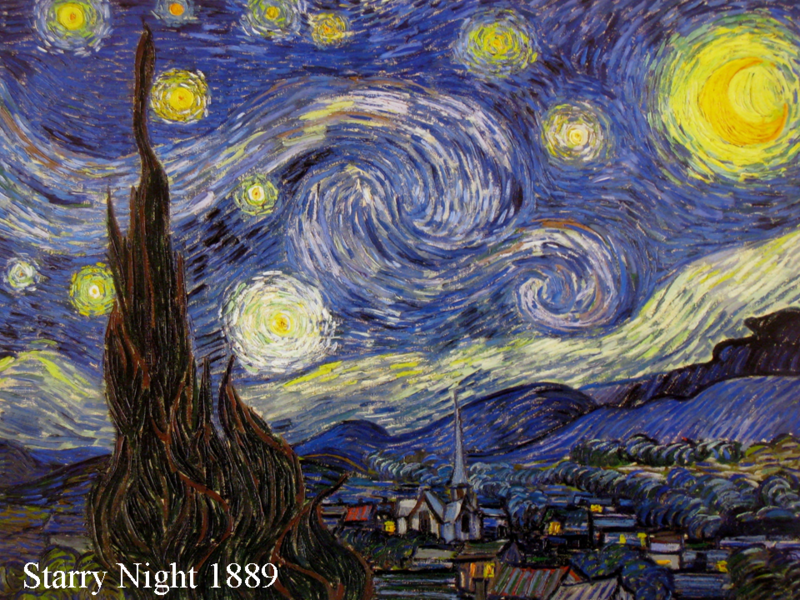 Discuss the MOVEMENT Vincent created with the swirling LINES of the night sky. Compare this landscape with an ordinary and realistic landscape painting or photograph. Sky is usually the negative space of the painting. It is usually the space left over around a positive image. In this painting the positive space is quiet and still; the negative space is full of exciting movement. Vincent van Gogh was born on March 30, 1853, in Groot-Zundert, which is in the southern part of the Netherlands (Holland). He was Dutch. His father was a minister and his family was respectable and middle-class. Vincent was the oldest of six children. He had three sisters and two brothers. As he grew up, Vincent loved books and drawing but he had no idea he wanted to become an artist until he was much older. After Vincent grew up, he worked as a preacher, a bookseller, a schoolteacher and an art dealer. None of these jobs satisfied him. When he was 27, Vincent started to paint. His first paintings were pictures of Holland farmers. He used dark colors for these paintings, which gave them a sad feeling. Nobody bought a single one of these paintings. For most of his life, Vincent’s younger brother Theo sent him money to live on, so that he could continue to paint. Theo was four years younger than Vincent was. He knew his brother was a great painter, even if no one else did. Vincent and Theo had a very close relationship and Vincent wrote many letters to his brother Theo, which still survive today. These letters are very detailed with the feelings behind Vincent’s paintings, his feelings about life and many of his intimate thoughts. Vincent moved to the South of France. It was a much sunnier, brighter place than Holland was. All of a sudden, he started to choose vivid blue, bold red and fiery orange and yellow paint colors. He daubed the paint onto his canvas in thick globs. Still, nobody would buy Vincent’s paintings. The people of his time thought Vincent’s paintings were strange looking and they did not like them. What made Vincent’s paintings so different was the fact that he didn’t just paint what he saw in front of him. He also painted what the scene made him feel like inside. Most of his paintings are filled with strong emotions. You can see lines of bright colors in his paintings that seem to swoop, dance, move, swirl and shimmer all over the picture. Vincent devoted himself to the appreciation of everyday beauty, but he was so eager to make others see this, that he frightened people away. They thought Vincent was strange. His paintings weren’t popular. He was also very poor and often didn’t have enough money to buy food. Vincent spent most of his life poor, alone, and lonely. Vincent also suffered from mental illness. He got into a fight with his artist friend and roommate, Paul Gauguin, on the night of December 23, 1888. Paul decided to spend the night in a motel after their fight. Vincent was so upset after Paul left that he had a mental breakdown and cut off part of his ear. In the morning, he was found unconscious in his bed. Vincent was rushed to the hospital, where he was unconscious for three days. 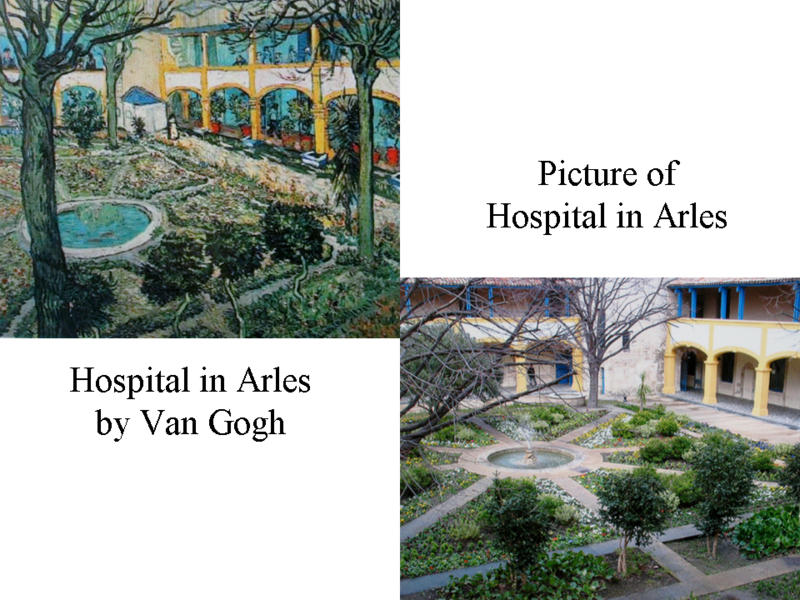 He survived and was named The Mad Painter by his neighbors, after going home from the hospital at Arles. Vincent spent time in mental hospitals to try to get his mental illness better but it didn’t work. On May 8, 1889, Vincent admitted himself to the asylum, or hospital, near Saint-Remy. 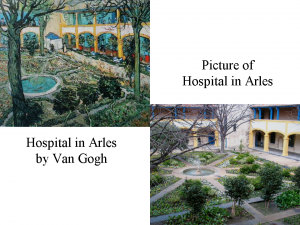 Here Dr. Peyron diagnosed him with epilepsy and van Gogh seemed to be improving. He could paint, draw and talk to the other patients. Then, in July, Vincent had another serious attack. Vincent had a short and sad life. On July 27, 1890, at the age of 37, Vincent went out into a field and shot himself in the stomach. He must have been very, very sad. Vincent died two days later, in his brother’s arms. Theo was so upset that he got very sick and died, just six months after Vincent. Although Vincent only sold one oil painting, one watercolor, and a few drawings while he was alive, he became a very popular artist after he died. In 1990, Vincent’s painting, Dr. Gachet, was sold in New York for $82 million, making it one of the most expensive paintings in the world! In 1883, Vincent moved to Nuenen, in Brabant (Holland), where his father had a Parish. During the next two years, he produced hundreds of paintings and drawings of the local peasant community. He also read, took piano lessons and gave painting lessons. In March of 1885, Vincent’s father, Theodorus van Gogh, died. Vincent was shaken but even more determined to succeed as an artist. After his father died, the local people turned against Vincent, so he moved to Antwerp* (Belgium), in November of 1885. Vincent stayed in a room above an art materials shop in Antwerp. He never returned to Holland. At the time, people disliked this picture. They found it too dark and the worn faces of the peasants ugly. This painting is very different from most of van Gogh’s paintings, which are known for his use of bright colors—especially yellow. Van Gogh sympathized with the hard life of these peasants. His dark colors seem to show a sad feeling. This picture was Vincent’s first masterpiece. His idea was that painting should be more concerned with conveying MOOD and expressing the inner feeling of the subject, than with representing things in meticulous outward detail (In other words, he preferred EXPRESSIONISM over REALISM). Draw or paint a picture of your own family eating dinner. *Antwerp—Belgium gained independence from Holland in 1831. Around the 1850’s, Belgium became a prosperous and active nation, although there was rivalry between its Flemish and Walloon communities. The country’s economy was built on coal mining and industrial expansion. At the center of its system of production and trade was the port of Antwerp, a large Flemish city on the Schelde River, 56 miles from the North Sea. Trade goods poured into Antwerp from America, Asia and other parts of the world. Information and ideas from different cultures, including Japan, also flowed into this port city. Antwerp had once been the home to the great Flemish painter, Peter Paul Rubens. The compassion that Vincent felt for poor people, as a preacher, was now channeled into his art. When a local businessman asked him to decorate his dining room, Vincent painted six scenes of farm workers, with dark colors, to emphasize the reality of peasant life. He also copied drawings and paintings of working people by famous artists he admired. One of these artists was the Frenchman, Jean Francois Millet*, who was well known for his paintings of country scenes. With this picture of two peasant farm workers resting at midday, van Gogh returned to the idea of the nobility of work, which had inspired many of his early, Dutch period paintings (The Potato Eaters was one of these). 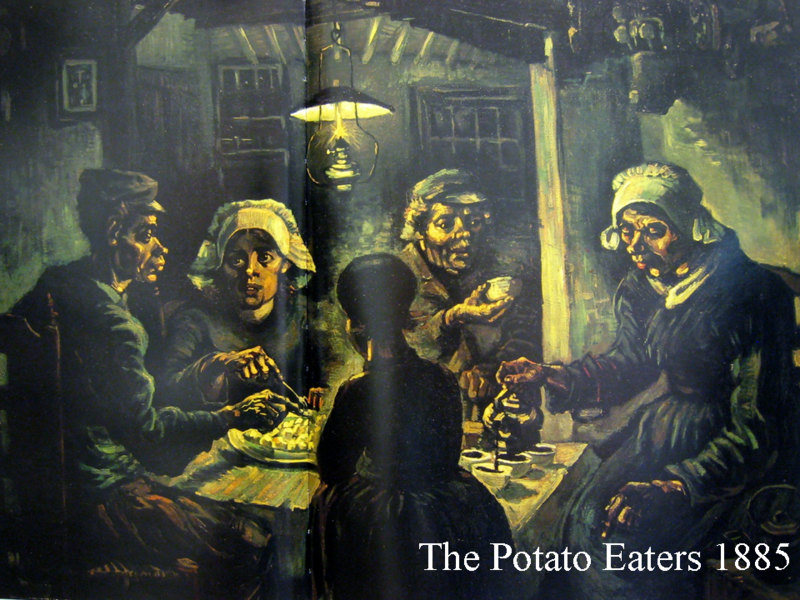 The peasants in this painting live in a sunny and bountiful land, in the southern part of France, and are painted in light colors, which sharply contrast the dark browns of Vincent’s Potato Eaters painting. Jean Francois millet was born on a farm, near Cherbourg, France, and never forgot that he had spent his boyhood working in his father’s fields. Jean showed an early talent for drawing and was sent to study with a painter in Cherbourg. Millet later went to Paris, after receiving a municipal grant that enabled him to study at the beaux-arts. The inflexible training he received there was too much for his temperament and he gave up formal study to work alone in the Louvre, copying and painting such masters as Leonardo da Vinci. For several years, Millet supported himself by painting portraits and decorative panels. Millet had his first painting accepted at the Paris Salon in 1844 and became a member of the French Academy in 1847. In 1848, Millet discovered that his first artistic love was painting the land that he grew up on and the people who worked it. He began to paint the rustic life of peasants and farm laborers. For the next twenty-two years Millet painted landscapes and the rural scenes of his childhood, for which he is best known. These scenes are painted in a realistic style. Millet’s realistic approach to peasant subjects had an important influence upon later nineteenth-century artist and very particularly upon Vincent van Gogh. Vincent was very dependent on his brother, Theo, both emotionally and financially. Vincent made almost no money throughout his entire life. He sold only one painting while he was alive. At the time this portrait was painted, Theo was having trouble with his job and had a sick son. Because Theo was supporting him, this must have caused Vincent deep anxiety, which shows in this portrait. Although Vincent demanded so much from his brother during his life, it didn’t push Theo away from him. Theo was so upset when Vincent died that he took ill and died only six months later. 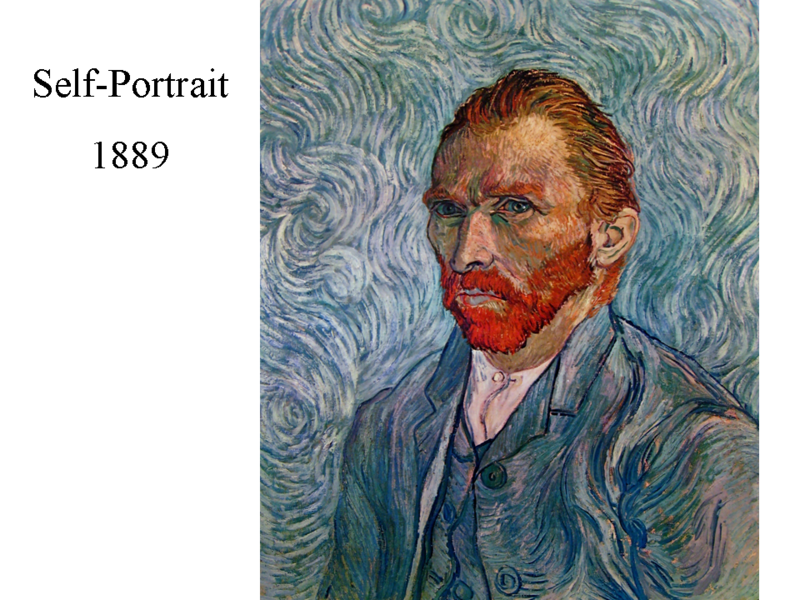 Vincent painted 37 self-portraits in his career. This one was painted in simple, cool colors (grays and bluish cast two tones), except for his hair. This particular self-portrait was done while Vincent was in a mental hospital in Saint-Remey. To offset the cool colors, he used particularly bold brush strokes. Self-portraits were often done due to the lack of other available models. It wasn’t always easy for Vincent to find models. He had no money to pay them and sometimes had a bad temper. It made people afraid of him and some even thought he was crazy. The many self-portraits that van Gogh did during his brief painting life are a barometer of his moods. In all of them, there is an anxious look in the eyes, as if he is worried about the identity of the person who stares back at him from the mirror. Make a self-portrait using cut colored paper. Choose appropriate skin and hair colors of paper and cut out a face. Eyes, lips, eyebrows, freckles, eyelashes and nose should all be cut from paper. DO NOT DRAW ANYTHING TO MAKE THE PORTRAIT—everything should be cut from paper. Sculpt a self-portrait from clay. Bring in small mirrors for the class to use as they draw their own self-portrait, just like Vincent. Paint a cool colored background, with curving lines similar to Vincent’s. Paint the self-portrait, cut around it and mount this on the painted background. When Vincent could afford to furnish his house, he chose simple pieces for his bedroom and fancier ones for the guestroom. The four-room building was the closest thing Vincent had, in his entire life, to a home of his own. Gauguin was coming to visit, and van Gogh imagined that other artists would soon flood to Arles. His home would be “the studio of the south”. He planned to hang works of his sunflower paintings and others, so Gauguin could see what he had been doing. A painting of his bedroom would be among them. 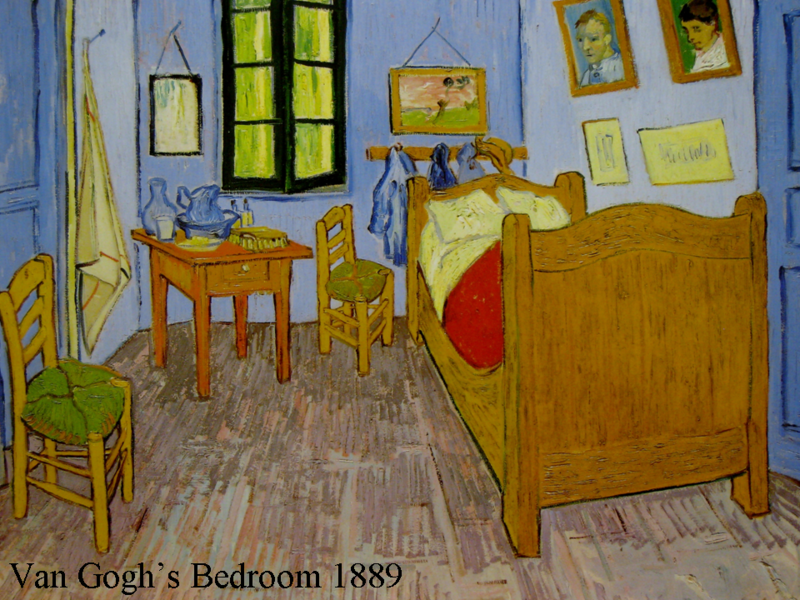 Van Gogh made two paintings of his bedroom. In a long letter to his brother Theo, he wrote about the colors he would use when painting the room, as if he were thinking out loud. 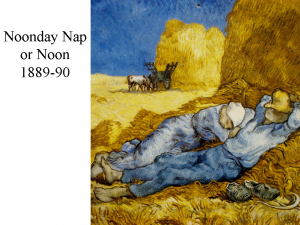 Vincent felt the colors should suggest sleep and “rest the brain”. 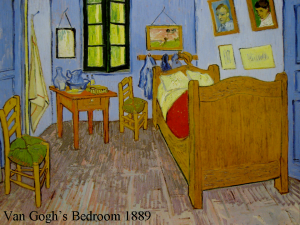 The bed, the chairs and other things in the room are painted Vincent’s favorite color—yellow. When he finished the painting, it pleased him so much that he made a copy of it for his mother and sister. Every piece of furniture is outlined in black or dark brown for emphasis. By not using shadows under them, Van Gogh made the furniture appear flat, just the way things looked in the Japanese prints he liked. The furniture has “a familiar and reassuring spirit” that van Gogh thought made it seem restful. All of the furniture is swept to one end of the room, which makes the foreground of the picture seem empty. The little nightstand is neatly set up for van Gogh’s use. There is soap in a dish, a pitcher and a glass for water, another pitcher and a bowl for washing, two bottles and a hairbrush. The brightest spot in the painting is the mirror above the small nightstand. A dash of white makes it stand out against the wall. It blankly reflects nothingness and makes the room seem emptier. The entire picture seems sad and lonely. Vincent has painted many pairs in this picture—pairs of chairs, bottles and pitchers on the nightstand, two fluffy pillows on the bed and a double row of two pictures. These might be symbols of Vincent’s constant wish to share his lonely life with someone else. Using the page with the four small line drawings of Vincent’s bedroom, color all four pictures in a variety of color schemes. 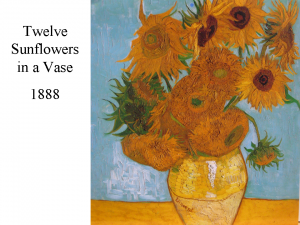 Try to color one in colors similar to the ones Vincent used in his painting. Color another picture in all warm colors and one in all cool colors. Try fluorescent colors for one picture, if you’d like. Consider creating PATTERN on the bedspread or wallpaper, for one picture or all of them. Cut out the finished pictures and mount all four on a piece of black construction paper, to create a dramatic contrasting frame. How does the bedroom change? Van Gogh’s chair was painted in daylight. His pipe and an open package of tobacco are part of a STILL LIFE painting. Stored on the red tile floor are onions in a wooden box. Van Gogh shows a corner of the box, a space just large enough for his signature. 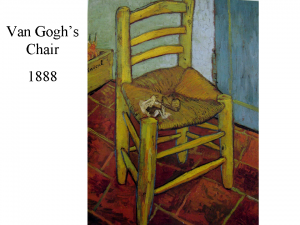 Van Gogh connected his chair to the room by making the thin, yellow line on the door touch the top of one of the chair legs. This close-up painting of his simple chair seems to express feelings of comfort and rest. In 1883, Vincent told his brother, Theo, of a story he had read about the English novelist, Charles Dickens. When Dickens died, his illustrator Lukes Fildes made a drawing of Dicken’s workroom and his now empty chair. Van Gogh explained to Theo that it was a symbol of the loss, through death, of one of the great pioneers of literature and Lukes Fildes’ grief at the end of his partnership with Dickens. The empty chair symbolized that Mr. Dickens would never again be able to fill that seat (since he was now dead) and it makes the room seem empty and lonely. Vincent told his brother Theo that Lukes Fildes’ illustration, “The Empty Chair” inspired this painting of his own chair. 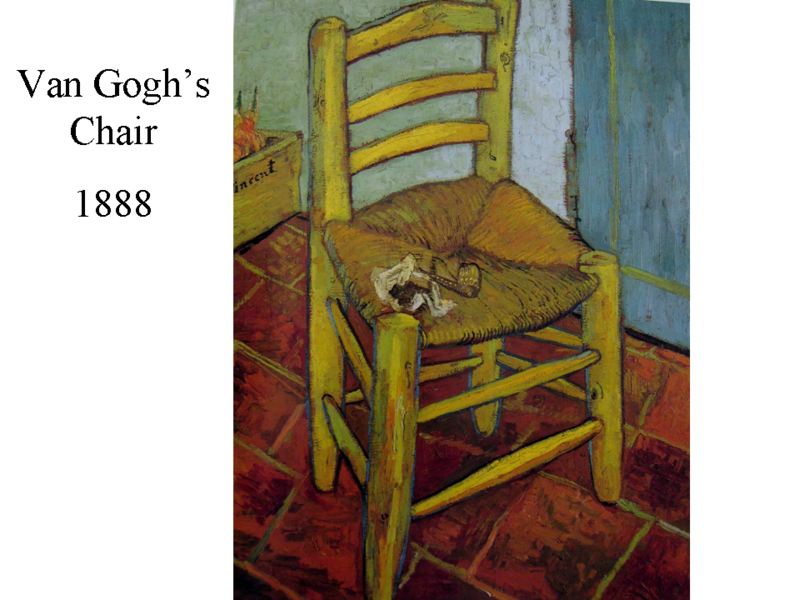 Van Gogh’s Chair is also a very lonely painting. Vincent also painted a picture of Gauguin’s Armchair. It is another empty chair, except for some books and a burning candlestick on the seat. 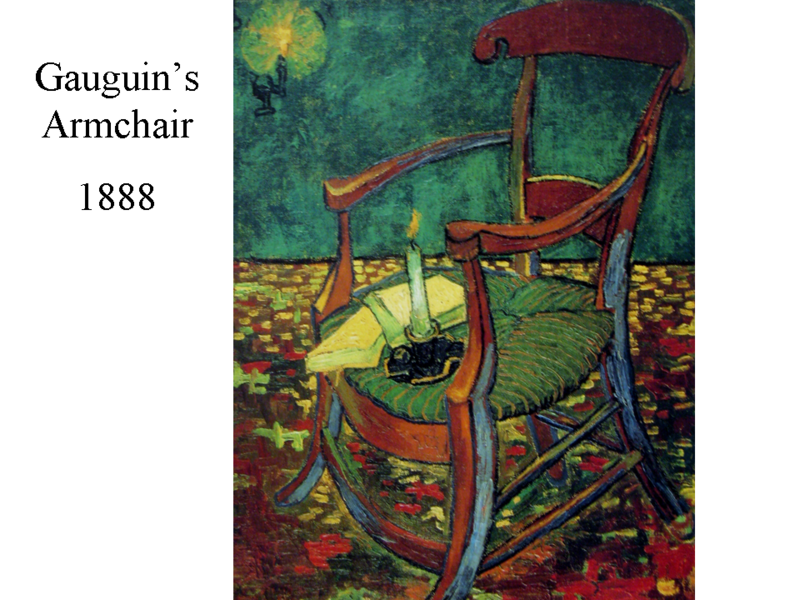 Vincent painted the two chairs as a memorial to a lost relationship after he and Gauguin had a horrible fight. To Vincent, Gauguin’s empty chair was a symbol of loss. Because the candle is still burning, it would give us the impression that the person who had been sitting in the chair was coming right back or might still be in the room. That might have been a sign of hope for Vincent, that the friendship might be repaired. When you look at this chair, does it seem like the owner is coming back? Yes, he left his pipe and tobacco. Do you think Vincent would be in as much of a hurry to get back to the chair as the person who has left a candle burning on their chair? Can we be sure this person is even coming back? We can’t really be sure the person who had been sitting in the chair is anywhere near. The chair is all alone. We know that Vincent was a lonely person. Does this painting remind you of loneliness? Why or Why not? Create a still life arrangement using a plain chair, a crate with onions and something else sitting on the chair that might give a clue about the owner of the chair—like a pad of paper and a pen, a paintbrush and paint, or a hammer and nails. Set up the still life in an arrangement similar to this painting. Draw the arrangement with color crayons, felt pens or paint it with watercolors. Point out the way the chair, the door and the wooden crate are darkly outlined, like a coloring book picture. Outline your painting with a black, fine tipped marking pen. This is a bright, friendly scene in green, yellow, red and blue. The richly colored wall looks like a green chalkboard that is waiting to be used. The chair’s arms seem to be reaching out to welcome us. The green and yellow lined seat looks as though it would be very comfortable to sit on. Although we don’t see Gauguin in the picture, we feel his presence nearby because of the two candles still burning in their holders and his books resting on the seat of his chair. We logically assume that a person would return quickly if they left a burning candle on the seat of their chair. These colors, and the curving lines of the wood, give Van Gogh’s painting of the chair dignity, personality and character. The chair almost seems ready to speak. The artist adds still more feeling of life to this exciting portrait with the glowing red, oranges and yellows of the rug. The colors are scattered like flowers in a field. 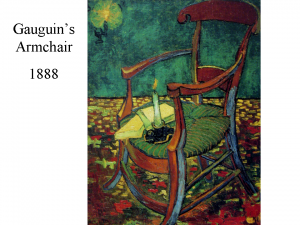 The difference between Gauguin’s Armchair and Van Gogh’s Chair is a sign of Vincent’s high regard for Gauguin. Gauguin’s chair is more ornate than Vincent’s. The books in this picture hint that Gauguin is a man of culture and intelligence. Explain to the class about the color wheel. Give everyone some red, yellow and blue tempera paint (the primary colors). Have kids mix two of the primary colors to create a secondary color (green, orange, or violet). Create a drawing similar to Gauguin’s Armchair and paint it using all three primary colors and one secondary color (4 colors in all). Point out the pattern in the carpet and on the chair seat. PAINT A PATTERN on the chair seat and carpet of your paintings. Consider painting a wallpaper pattern on the wall. During his stay at the asylum at Saint-Remey, Vincent created a series of paintings of cypress trees, which he saw as he was out on excursions from the asylum. He liked their dark color. Vincent called them…“a splash of black in a sunny landscape, but it is one of the most interesting black notes and the most difficult to hit off exactly”. Two trees are intertwined and line a curving lane. The trees tower up into the dark heavens between the sun and the moon. The picture is a good example of van Gogh’s style of brush work. He uses heavy strokes with lots of paint and that is easy to see in this picture. Vincent paints with single, short strokes, thickly applied in specific patterns, in each area of the painting. This makes the painting seem more animated and unreal. Vincent found a way to suggest MOVEMENT in his paintings using swirling, curling, wavy lines, painted with very thick paint (called Impasto). He often used a large brush, a palette knife and maybe even his fingers, to paint with this thick paint. Vincent’s paint is so thick that it forms ridges and troughs on the canvas. Add powdered soap flakes to tempera paint to make it thicker, like Impasto. Create two separate dark shades of green (add black). 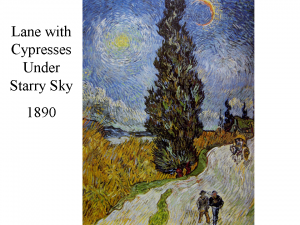 Paint a Cypress tree similar to the way Vincent painted. Use your fingers, a comb, a plastic knife or any other tools you can think of to make an interesting pattern. Blend the two shades of green paint on the picture to add shadow and dimension to the tree. Look closely at the curving lines you can see in Vincent’s Cypress trees and try to create the same flowing and curving MOVEMENT in your own tree. This painting is undoubtedly one of van Gogh’s best known works. The artist presents and arrangement of twelve sunflowers, with golden blooms, tangled sepals and slightly twisting stalks, in a vase. Van Gogh usually picked his flowers at dawn, to be able to paint them when fresh, before they showed signs of wilting. His letters reveal that he saw these bright yellow sunflowers as symbols of light, sun and vitality. If you look closely at this painting, you can see the thick brushstrokes Vincent painted with. Create a torn paper picture of this painting, using construction paper. Don’t use scissors, just TEAR the construction paper into the shapes you need. Don’t draw anything in the picture either. It may help to draw the shapes of the petals on the back side of the paper before trying to tear them out. Bring in a vase of flowers (you can find silk sunflowers in the fall or spring but any flowers will work). Have the kids draw and paint the vase of flowers. Bring in a large silk sunflower and have the kids draw or paint it. A good project for younger kids—Cut out yellow sunflower petals and glue them to a background. Leave a large open circle in the center of the petals and outline it with a black crayon. Glue real sunflower seeds in the center of the sunflower. Vincent painted quickly and often completed a canvas in only one day. Between February and December of 1888, he completed over ninety drawings and one hundred paintings. Van Gogh’s colors seemed to get lighter and brighter until it almost seemed he was capturing the sun itself. Vincent was very interest in the sun, and yellow became his favorite color. 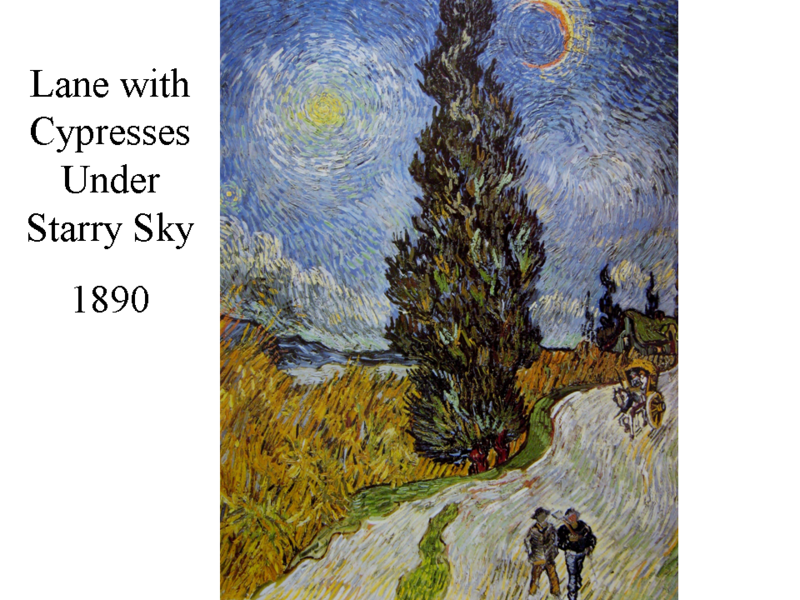 The sun or symbols of it (stars, lanterns, flames, and sunflowers) appear in many of his paintings. The Starry Night explodes our imaginations. While the village sleeps, it seems guarded by the pointed church steeple and the towering cypress tree. The night sky vibrates, swirls, and rolls in the starry heaven, like waves in a stormy sea. Cradling the town protectively, the hills spread like a blue blanket of color. They are silhouetted against a strip of white sky, reflected from the golden crescent moon above them. Van Gogh shows us the distant stars orbiting in space. He uses his brushstrokes to make electric waves from the stars, like pebbles dropped in water. Vincent knew that the earth and sky, the stars and trees, all that we can see, are alive. Vincent felt that he was only an instrument in the creative process of the universe. While he was in the hospital at Saint-Remy, Vincent alternated between periods of hyperactivity and long spells of deep depression. His altered state of mind was reflected in a change in his style of painting. During the time he spent in Arles, his work had been characterized by the use of pure colors, uniformly spread in large areas. At Saint-Remy gray, ochre (golden yellow), and blended colors appeared in his paintings again. Another change was that the energy Vincent had been expressing in his paintings, with the use of pure color, instead made itself felt in the LINES of his paintings. They twisted and turned, writhed, flared and became grouped in great swirls, filling the canvas, with movement. The result was a dynamic style of painting in which the artist’s inner turmoil was projected on to the world. How did he make the moon and the stars seem to glow and glitter? Compare these two paintings. Point out their similarities and differences. Have kids color stars and a moon with heavy yellow crayon, surrounded with a halo (circle) of white, on a piece of white construction paper. Make sure to press very hard with the crayon. Paint over the picture with black or blue watercolor or thinned tempera paint. The crayon stars will resist the paint and show through.